Someone asked me which my favourite Neil Gaiman book was and I immediately thought of an old man wearing yellow gloves, with a wheezing, cackling laugh and a faint West Indian-ish twang in his voice. Anansi Boys. I am re-reading it right now. We all know Anansi as the trickster Spider-god brought to America by the African slaves. I first 'met' Mr. Nancy in his checkered suit, smoking a thin cigar in Gaiman's earthbound-deities novel American Gods. And then in Anansi Boys, as the father of Fat Charlie Nancy, the one who spends his entire life chasing women, embarrassing his son, Fat Charlie, and then drops dead on a karaoke stage following a particularly hilarious performance. Mr. Nancy, the humorous story teller, doesn't have much stage time in American Gods, but he does have a strong presence. He is fun, and relaxed and has the best lines. "They don't look very friendly," said Nancy. "A story's a good way of gettin' someone on your side. And you don't have a bard to sing to them." "Olden days, all the animals wanted to have stories named after them, back in the days when the songs that sung the world were still being sung, back when they were still singing the sky and the rainbow and the ocean. It was in those days when animals were people as well as animals that Anansi the spider tricked all of them, especially Tiger, because he wanted all the stories named after him. 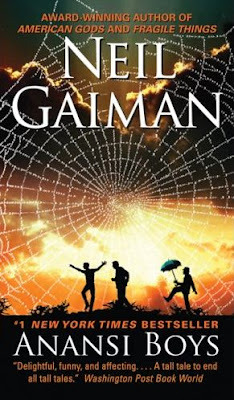 Stories are like spiders, with all their long legs, and stories are like spiderwebs, which man gets himself all tangled up in but which look so pretty when you see them under a leaf in the morning dew, and in the elegant way that they connect to one another, each to each. What’s that? You want to know if Anansi looked like a spider? Sure he did, except when he looked like a man. No, he never changed his shape. It’s just a matter of how you tell the story. That’s all." The increasing gossip about the American Gods HBO series is making me wonder who they will cast as Mr. Nancy. And despite the numerous online votes for Morgan Freeman, I just don't see him pull off an Anansi. Speaking of which, I am really looking forward to this series, if there is going to be one, for a lot of the other awesome characters like Laura, Low-key, Mr. Jacquel and Mr. Ibis and Sam Black Crow. Character Connection is a bookish meme hosted on The Introverted Reader. It has been ages since I read these books, but I do remember liking the trickster, Mr. Nancy! 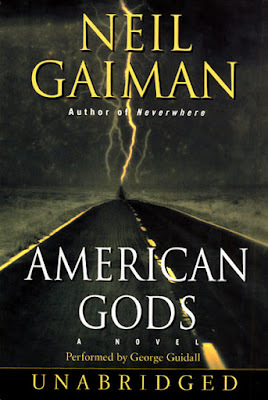 And I had not heard any rumors about an HBO series of American Gods. Makes me even more glad I have it! Thanks for mentioning that!